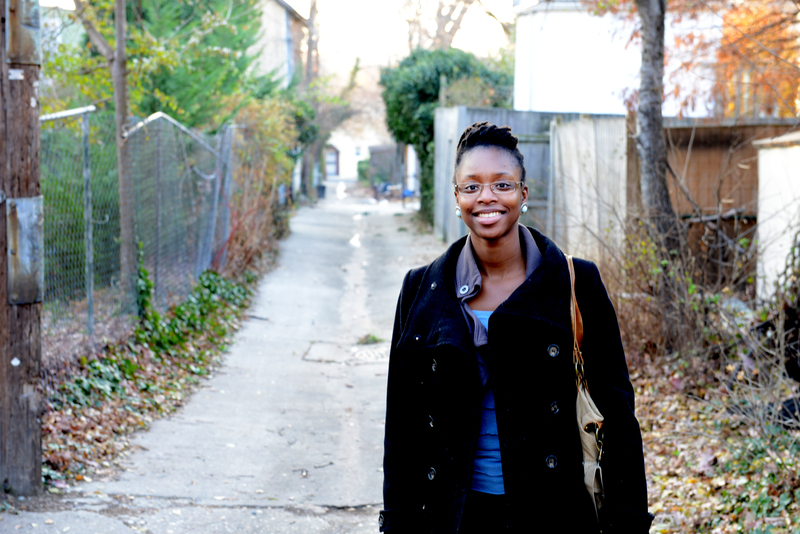 Public health advocate focuses on behavioral change to restore Baltimore’s alleys. Alleyways are the urban landscape’s forgotten places. In cities like Baltimore, they are often synonymous with trash and crime. Jerrie Kumalah sees something different. She thinks these neglected places hold the potential to transform communities. The way to get there, she says, is to understand the behaviors that cause alleys to become neglected and dangerous – and to set about changing those behaviors. In Kumalah’s mind, Baltimore’s alleys could become spaces where artists unleash their creativity with murals and installations. Kids could play games. People could meet their neighbors at a barbecue or block party. And communities would be made stronger as a result. Of course, none of that will happen if people think of the areas behind their homes as little more than places where rats and drug users lurk. The starting point has to be cleaning them up. But keeping them that way is the challenge. Kumalah’s starting point is a block-by-block assessment of a neighborhood’s alleys. The next step is talking with residents and community associations and asking some tough questions: If people aren’t raking their leaves or bothering to recycle, why not? If trash or rats are a problem, how come no one is calling the city to report that? Can renters be made to care more about their communities? How are neglectful behaviors connected to how people feel about where they live? Kumalah wants to understand residents’ problems and priorities while also nudging them to change their behaviors with things like free bins, training for block captains and community workshops. She has begun reaching out to residents in five North Baltimore neighborhoods, with guidance from the Greater Homewood Community Corporation. Kumalah approaches this issue from a public health perspective. The trash, rodents and drug use that untended alleys attract affect health in obvious ways, but there are also subtler connections. Tidy alleys are a sign of community strength, and strong neighborhoods have a better chance of reducing the health disparities that are so persistent in Baltimore. “My big focus is on how place influences health,” she says. Kumalah, a native of Sierra Leone, moved to Bowie as a high-schooler and attended the University of Pennsylvania and UNC Chapel Hill. Formerly with the D.C. school system and the Baltimore City Health Department, she is now a CityStat analyst in the mayor’s office. Her next goal: a PhD in public health, focusing on behavioral and community health.